A LEADING North-east apprenticeship-training company has played host to a group of youngsters from Bucksburn Academy taking part in a specialist course designed to give an insight into practical engineering. The Marketplace course has been created by ITCA Training as part of Skills Development Scotland’s Our Skillsforce initiative, to give secondary school pupils hands-on experience in engineering and fabrication welding. 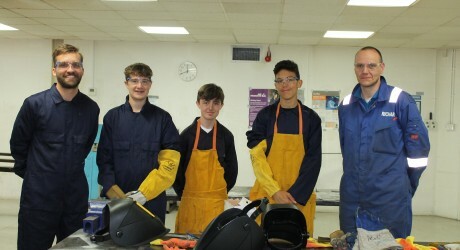 Expert staff from ITCA gave a health and safety induction followed by engineering and fabrication welding demonstrations, and all pupils carried out a range of practical tasks throughout the day. ITCA managing director, June Jones, said: “We were pleased to welcome the group of pupils from Bucksburn Academy to ITCA. Fraser McLachlan, principal teacher of pupil support at Bucksburn Academy, said: “The pupils really enjoyed their time at ITCA, and it was hugely beneficial for them to be able to get involved in practical workshop activities. MEDIA RELEASE issued by Frasermedia. You too can share your stories (aka press or media releases), on this site. Email here for more information.